[PDF] What is this thing called Knowledge? | Free eBooks Download - EBOOKEE! [PDF] What is this thing called Knowledge? Description: What is knowledge? Where does it come from? What kinds of knowledge are there? Can we know anything at all? 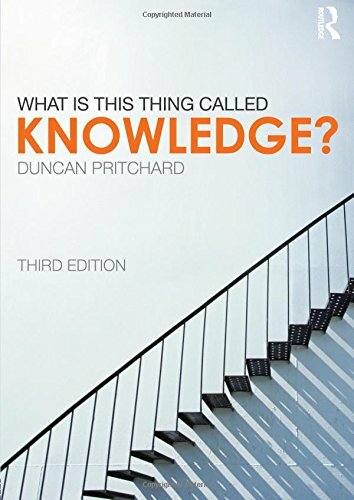 This lucid and engaging introduction grapples with these central questions in the theory of knowledge, offering a clear, non-partisan view of the main themes of epistemology. Both traditional issues and contemporary ideas are discussed in sixteen easily digestible chapters, each of which conclude with a useful summary of the main ideas discussed, study questions, annotated further reading and a guide to internet resources. Each chapter also features text boxes providing bite-sized summaries of key concepts and major philosophers, and clear and interesting examples are used throughout. The book concludes with an annotated guide to general introductions to epistemology, a glossary of key terms, and a summary of the main examples used in epistemology, This an ideal first textbook in the theory of knowledge for undergraduates coming to philosophy for the first time. The third edition has been revised and updated throughout and features two new chapters, on religious knowledge and scientific knowledge, as part of a whole new section on what kinds of knowledge there are. In addition, the text as a whole has been refreshed to keep it up to date with current developments. No comments for "[PDF] What is this thing called Knowledge? ".